We are a city that tries very hard. This is especially true when it comes to being green. We want badly to be green. 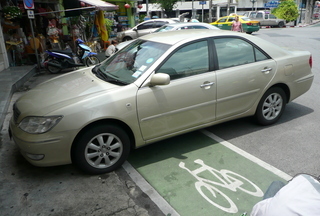 We have added bicycle lanes… that parked cars block with impunity and that run down the middle of vendor- and pedestrian-filled footpaths. We stress the importance of public transportation, while dickering over the replacement of noxious, smoke-belching busses and the ever-delayed extensions of rail lines. And we participate in Car Free Day. While the rest of the world celebrates Car Free Day on September 22, which this year fell on a Tuesday, we found that a bit inconvenient and so instead celebrated it on the previous Sunday. While the rest of the world emphasizes getting out of the car on onto your bikes, Car Free Day was just an excuse for those of us who already are cycling, to get together for what wasn’t much more than a publicity stunt. While mayors and politicians in major cities around the world actually get out of their cars and bike to work or take public transit, our politicians were chaffered to the Car Free Day events. Only a few people from the Ministry of Energy actually made the effort. While this may sound a little bitter, I assure you I’m not. 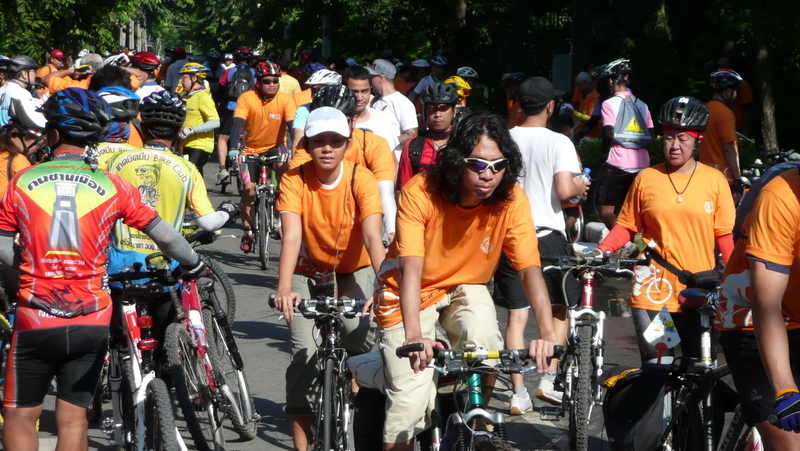 The (pre-)Car Free Day event brought together about 5,000 cyclists from around the city. We met at Kasetsart University (originally is was going to be Sanam Luang, the large royal parade ground, but that had been under seige by the “red shirt” anti-government protesters the day before and we thought better of going there) for a group photo on the football pitch, organized into a map of Thailand. This was dutifully reprinted in some of the local papers the following day, having absolutely no effect on the number of cars on the road on the 22nd. This publicity stunt was reasonably well organized, but still required more than an hour of standing around in the hot sun. I didn’t have the patience, since I actually wanted to ride. So I snapped this picture after about twenty minutes. It is meant to be the north third of Thailand. Chiang Rai is kind of up near the goal posts. Everyone was in a jovial mood. 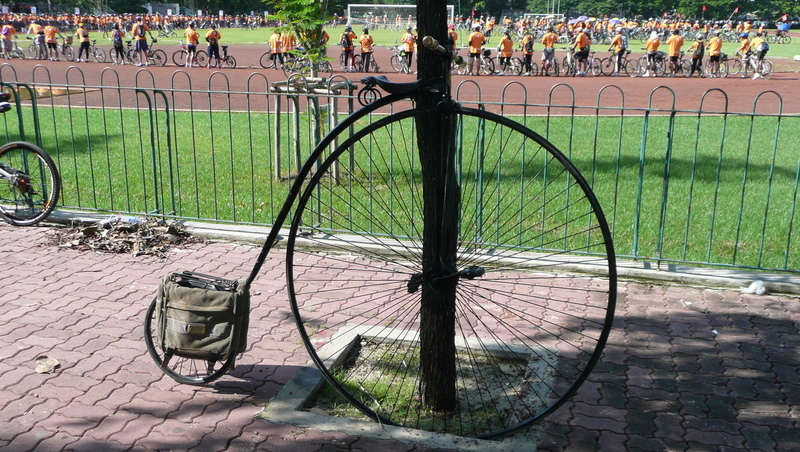 Many people who ride for fun have wonderful, unique bicycles. There are several that are doctored in various ways, customized to express the personalities and playfulness of their owners. We even had a few Victorian bicycles. Can you imagine riding this in Bangkok traffic? On my way home, I explored a stretch of road I did not previously know about, heading along Thanon Prasert-Manukitch through the Lat Prao district to Thanon Ram-Intra. I think I once drove out here but have never cycled in this area. Two blocks from home, while riding along a street that was mid-way through repaving, my rear tire popped and I started to lose air. Thankfully, I made it back home before the tube was completely flat. This served as the necessary prompting to finally take my bicycle in for maintenance. I’ve had it more than three years without any work done to it. This entry was posted in Uncategorized and tagged Bangkok, Bicycling, Car Free Day, cycling, Krungthep by christao408. Bookmark the permalink. I wish DC would try a little harder! This city has so much potential to be a little greener. If I have to bike 15 miles to work, I will probably exhausted before I start to work. lol.But definitly will looks for way to be greener all the time. Those are some cool pictures Chris. I am with Secade… I don’t know how to ride a bike. I envy every one who rides one. We have something similar in Toronto. It’ a great idea. Wish there were more car free areas in cities too! It looks like it was a wonderful pre-car free day to be riding, despite the lack of impact. But given the size of turn out, one can be hopeful that perhaps this trend will grow. Your pictures remind me of the California AIDS Ride I did in 2002. It was great fun. Sometimes I long for the days when China was a nation of cyclists. car free day is just wonderful! it should be a mandatory around the world thing :pwhen i went to ecuador, i was surprised to learn that in quito, every other sunday is a car-free day! @TheCheshireGrins – Yes, DC really should be a bicycle friendly (and transit friendly) city, shouldn’t it? @yang1815 – It was. 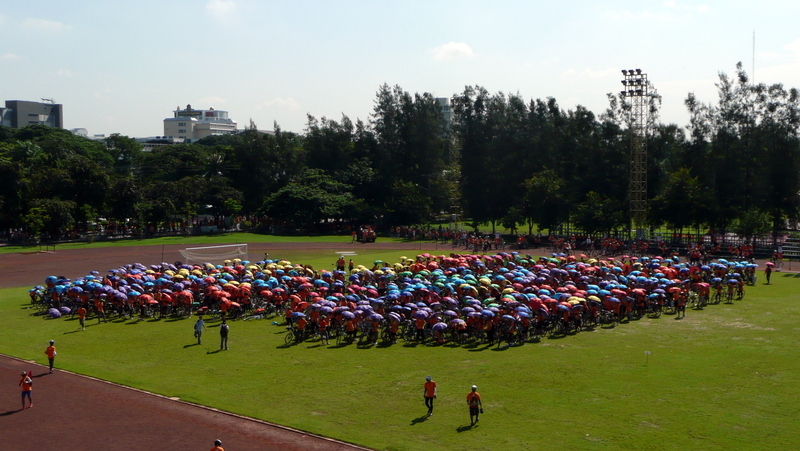 @Wangium – There were some odd and customized cycles. One boy was on a unicycle. Can’t imagine carrying groceries home, though. Riding a unicycle in SF must be tough! @secade – Really? Didn’t you grow up in Ohio? I thought bicycle riding was a must for all midwestern children. @ZenPaper – The bag was cool, eh? I think it must have been custom made. @vsan79 – But after you do it a few times, you’d be amazed how quickly you adapt. Plus, when riding to work, the point isn’t to sprint or race, you just ride at a liesurely pace. @ZSA_MD – Never too late to learn something new. You and Mohamad could get a bicycle built for two! @brooklyn2028 – There are a few blocks of Toronto that would be very nice to block off and turn into pedestrian plazas. Especially some of the more “neighborhood” areas. @murisopsis – That’s so true, nobody walks on sidewalks so might as well use them as bike paths. Of course, here in Bangkok the sidewalks are outdoor restaurants! @Redlegsix – Riding here isn’t so bad for one reason – the drivers are paying attention. Back in the US, drivers are totally in a bubble, unaware of their surroundings. Here, they know that something unexpected will probably happen, so they prepare for it. As for Sanam Luang, the weekend market is now up at Chatuchak Park, north of the Dusit Palace. @doiturselfer – With that kind of turn out, I guess it was similar to the AIDS ride, wasn’t it? I remember you had a really good experience doing that ride. @CurryPuffy – Thankfully, they are converting those to NGV, so the soot is improving. The drivers, however, are not. @choyshinglin – And what’s amazing is how rapidly the shift from cycles to cars has taken place! @iskrak – Every other Sunday? What a great idea. Truly a “spare the air” idea. @sf12345 – Well, it would be nice but I am glad to report that air quality is (slowly) improving here. A lot of the old diesel busses have converted to compressed natural gas, so that is decrease soot and particulate matter. Still a long way to go, of course, and the humidity helps hold the pollution in a perpetual hazy fog. Thanks for your comment and subscription.